This traditional style two piece sectional sofa brings comfortable seating into your classic style home. Each of these pieces has top-grain leather, all hard-wood frames, and a lifetime warranty on frame & suspension. Double-doweled joints with full-length corner blocks, loose back cushions, and loose seat cushions made of down complete this extremely comfortable upholstery collection. Optional wood legs in black, natural or walnut finish available. Eight-way hand-tied suspension also available. For a more traditional look, add optional brass tacks for nail-head detailing. This exquisite sectional sofa features rolled arms and beautiful exposed wood legs. Sink into this wonderful, cozy, and relaxing sofa. Mix and match with any of the other pieces available to bring this beautiful traditional leather piece into your home. The Morgan Traditional 2 Piece Sectional Sofa with Chaise by American Leather at AHFA in the area. Product availability may vary. Contact us for the most current availability on this product. 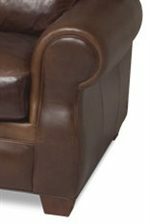 MOR-SO3-RA Right Arm Sitting 3 Seat Sofa 1 86" 42" 37"
MOR-SCH-LA Left Arm Sitting Chaise 1 35" 71" 37"